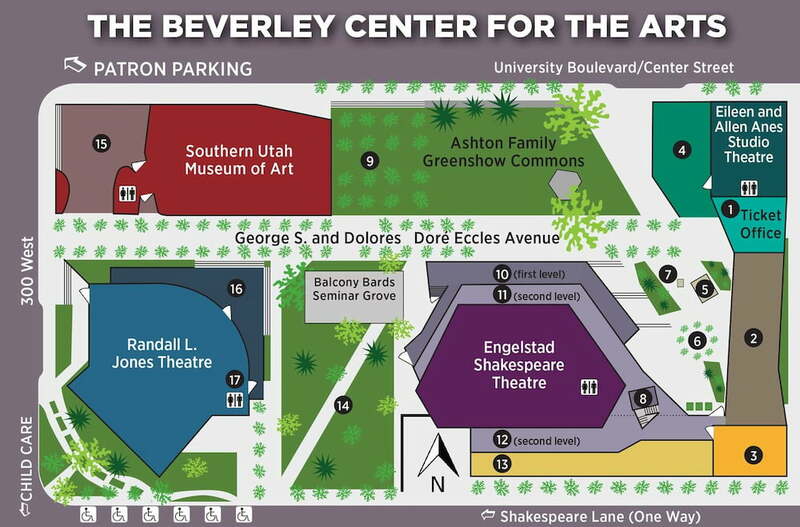 The Beverley Taylor Sorenson Center for the Arts (The Beverley) incorporates visual arts, live theatre, and dynamic arts education on the Southern Utah University campus in Cedar City, UT and dramatically enriches the cultural life of Cedar City and its surrounding region. The Beverley is located at 195 W. Center Street in Cedar City, UT. A large-covered plaza welcomes patrons to SUMA, a state-of-the-art museum, which features approximately 5,300 square feet of exhibition space composed of four adaptable galleries. The new outdoor Shakespeare theatre has the same intimate actor/audience relationship and feels very similar to the now retired Adams Theatre. The space has updated amenities and modern accessibilities, including an elevator and increased ADA seating. The Utah Shakespeare Festival uses this stage from late June until early September for plays by William Shakespeare and other plays relevant to that era. This indoor theatre is used by the Utah Shakespeare Festival during its season for musicals and modern plays. The SUU College of Performing and Visual Arts uses it for their productions as well. The Artistic and Production Facility includes a rehearsal space, costume shop, and administration offices.